With all the rain we’ve been having lately, everyone is sort of champing at the bit to be outside. This is particularly obvious in people’s desire to eat outdoors, especially in the winter: the pleasure is made all the more intense by the knowledge that this is not something Parisians can typically do. 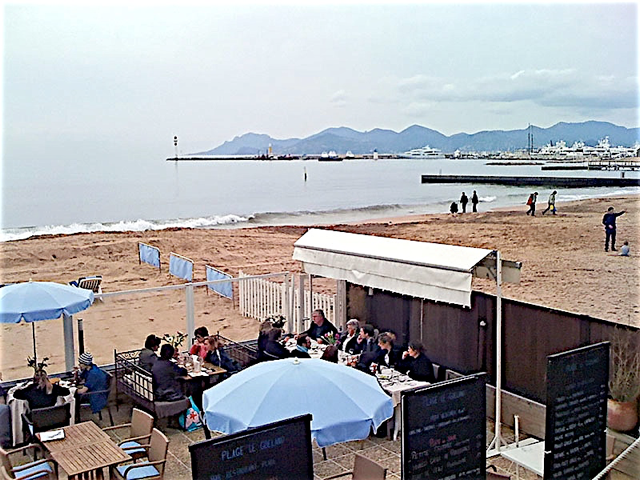 This past Saturday, as I strolled along the Croisette, the skies were gray, there was a chilly breeze, and it looked like raindrops were just moments away. Evidently, the patrons of the Goéland beach restaurant didn’t care: gray skies never hurt anyone, glass panels protect against all but the strongest winds, and rain, well, it wasn’t raining, now, was it. And so, looking at the Esterel mountains in the distance and listening to the sound of the waves, people were enjoying lunch.